Clearing Corporation (DTCC), which provides financial transaction and data processing services for the global financial industry, cloud computing has reached a tipping point1. Today, financial services companies can benefit from the capabilities and cost efficiencies of the cloud. In October of 2016, the Federal Deposit Insurance Corporation (FDIC), the Office of the Comptroller of Currency (OCC) and the Federal Reserve Board (FRB) jointly announced enhanced cyber risk management standards for financial institutions in an Advanced Notice of Proposed Rulemaking (ANPR)2. These proposed standards for enhanced cybersecurity are aimed at protecting the entire financial system, not just the institution. To meet these new standards, financial institutions will require the right cloud-based network security platform for comprehensive security management, verifiable compliance and governance and active protection of customer data and workloads. 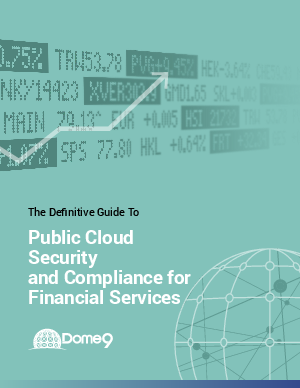 The Dome9 Arc platform assists financial institutions with their transition to the cloud by enabling complete control over managing security and compliance requirements with these three critical steps that will be discussed in this whitepaper.